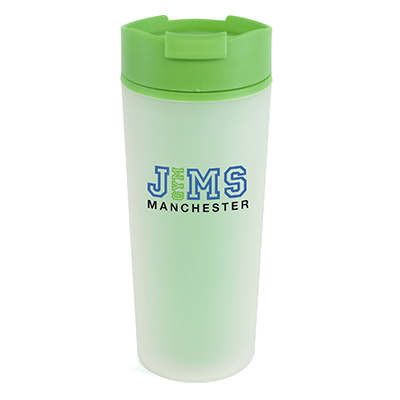 Model:MG0111 ANCOATS Description: 450ml double walled stainless steel tumbler with plastic interior, coloured base, top and slide sipper lid. Colour Options: Black,Royal Blue,Red Product Data Specification Product Size 180 x 85 mm dia. Product Weight Ink Colours If Applicable N/A Additional Information Price includes a 1 colour wrap print. Price excludes Carriage & Origination. Lead Times 5 working days from artwork approval Personalisation Data Max Personalisation Pad/Screen Print Area 170 x 30 mm Engraving Area 60 x 35 mm Full Colour Area N/A Embroided Area N/A Max Spot Colours 2 Foil Block Embossing N/A Notes Price includes 1 colour wrap around print. Set up and carriage are additional. Model:MG0906 BAMBOO GRIPPY Description: 330ml single walled tumbler made from 50% bamboo and 50% PP plastic. 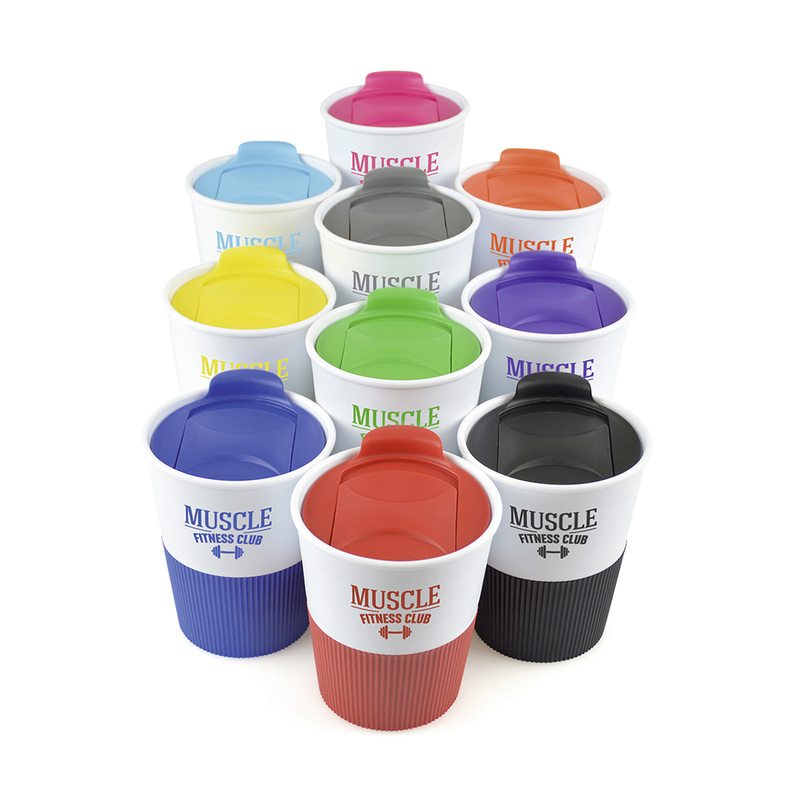 The tumbler has a push on lid with sliding sipper and rubber feel grip to the bottom half. Available in natural. Colour Options: Natural Product Data Specification Product Size 130 x 92 mm dia Product Weight Ink Colours If Applicable Additional Information Price includes 1 colour print to plastic sleeve. Price excludes Carriage & Origination. Lead Times 5 working days from artwork approval. Personalisation Data Max Personalisation Pad/Screen Print Area 170 x 35 mm Engraving Area Full Colour Area N/A Embroided Area N/A Max Spot Colours 1 Foil Block Embossing N/A Notes Price includes a 1 colour print to 1 position. Set up and carriage are additional. 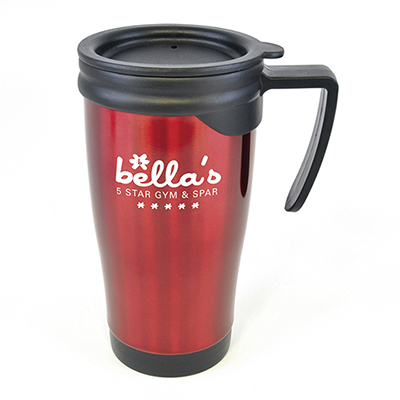 Model:MG0029 BLAKE Description: 475ml double walled stainless steel travel mug with push on lid and slide cover. Colour Options: Silver Product Data Specification Product Size 200 x 85 mm dia. Product Weight Ink Colours If Applicable N/A Additional Information Price includes a 1 colour wrap print. Price excludes Carriage & Origination. Lead Times 5 working days from artwork approval. Personalisation Data Max Personalisation Pad/Screen Print Area 170 x 35 mm Engraving Area 60 x 50 mm Full Colour Area N/A Embroided Area N/A Max Spot Colours 4 Foil Block Embossing N/A Notes Price includes 1 colour wrap around print. Set up and carriage are additional. 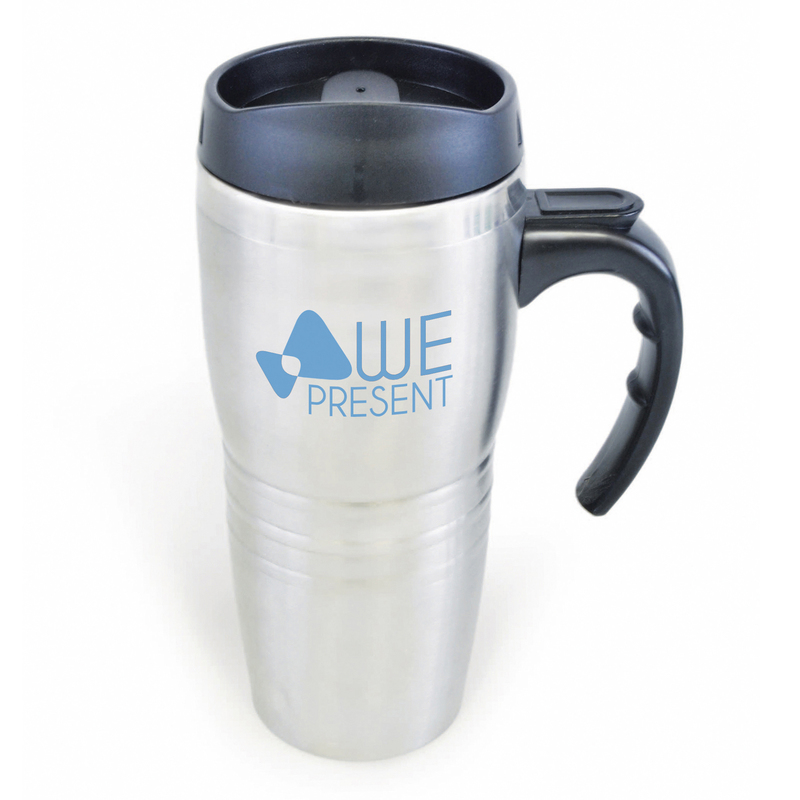 Model:MG0051 CAF�E Description: 500ml plastic single walled take out style coffee mug. 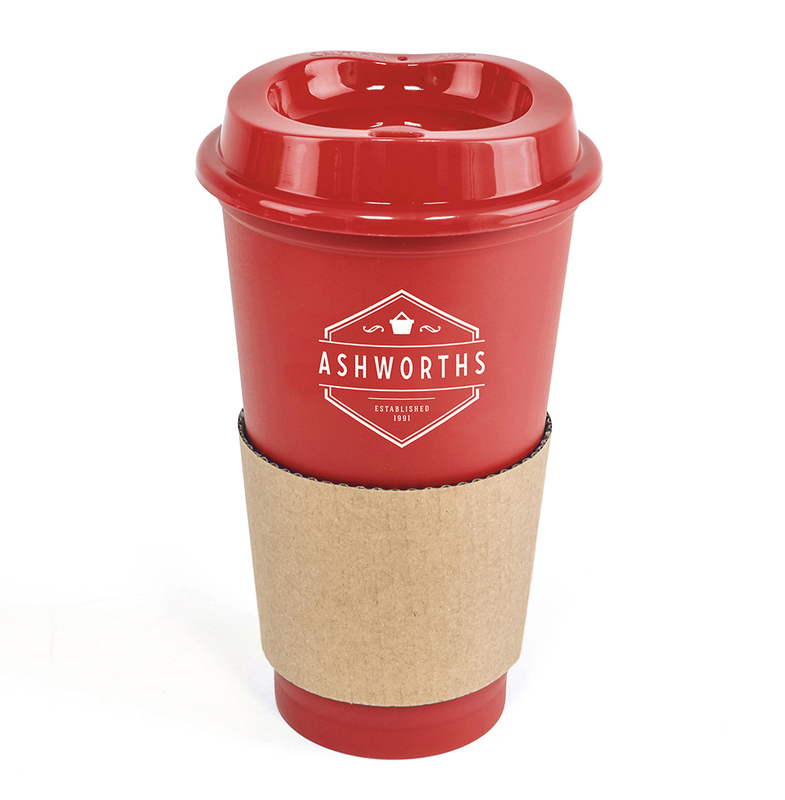 Coloured lid matches the mug and it comes with a brown paper sleeve for grip and protection when holding. Colour Options: Amber,Black,Blue,Cyan,Green,Pink,Purple,Red,White,Yellow Product Data Specification Product Size 160 x 90 mm dia. Product Weight Ink Colours If Applicable N/A Additional Information Price includes a 1 colour wrap print. Price excludes Carriage & Origination. Lead Times 5 working days from artwork approval Personalisation Data Max Personalisation Pad/Screen Print Area 170 x 40 mm Engraving Area N/A Full Colour Area N/A Embroided Area N/A Max Spot Colours 1 Foil Block Embossing N/A Notes Price includes 1 colour wrap around print. Set up and carriage are additional. 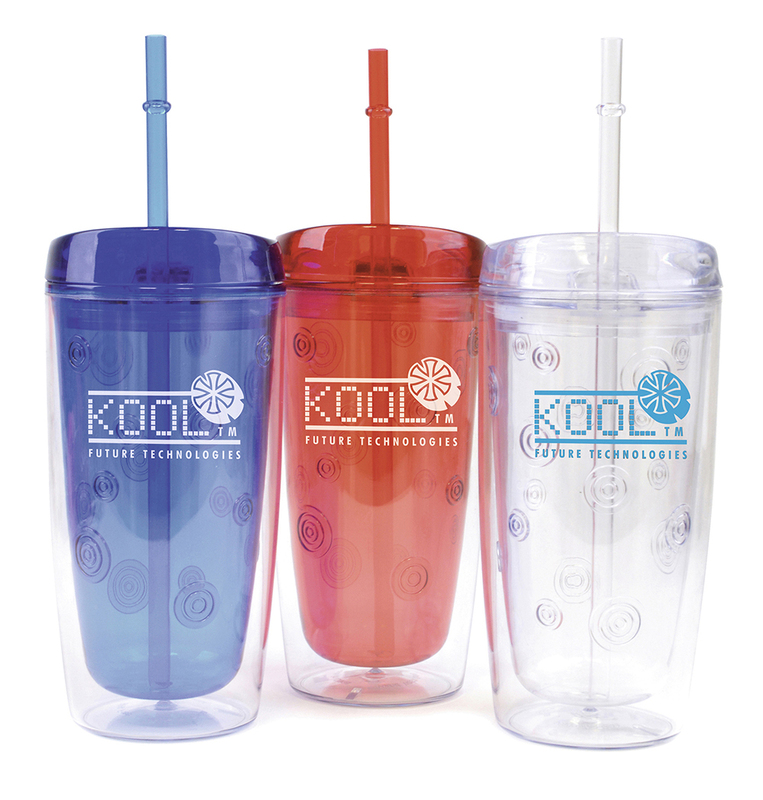 Model:MG0808 CHESTER Description: 450ml double walled anti-spill plastic tumbler with matching coloured straw. 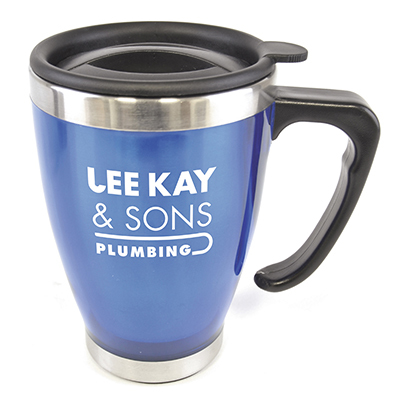 Not suitable for hot drinks Colour Options: Blue,Red,Trans Product Data Specification Product Size 180 x 85 mm dia. Product Weight Ink Colours If Applicable N/A Additional Information Price includes a 1 colour wrap print. Price excludes Carriage & Origination. Lead Times 5 working days from artwork approval Personalisation Data Max Personalisation Pad/Screen Print Area 60 x 180 mm Engraving Area N/A Full Colour Area N/A Embroided Area N/A Max Spot Colours 1 Foil Block Embossing N/A Notes Price includes 1 colour wrap around print. Set up and carriage are additional. 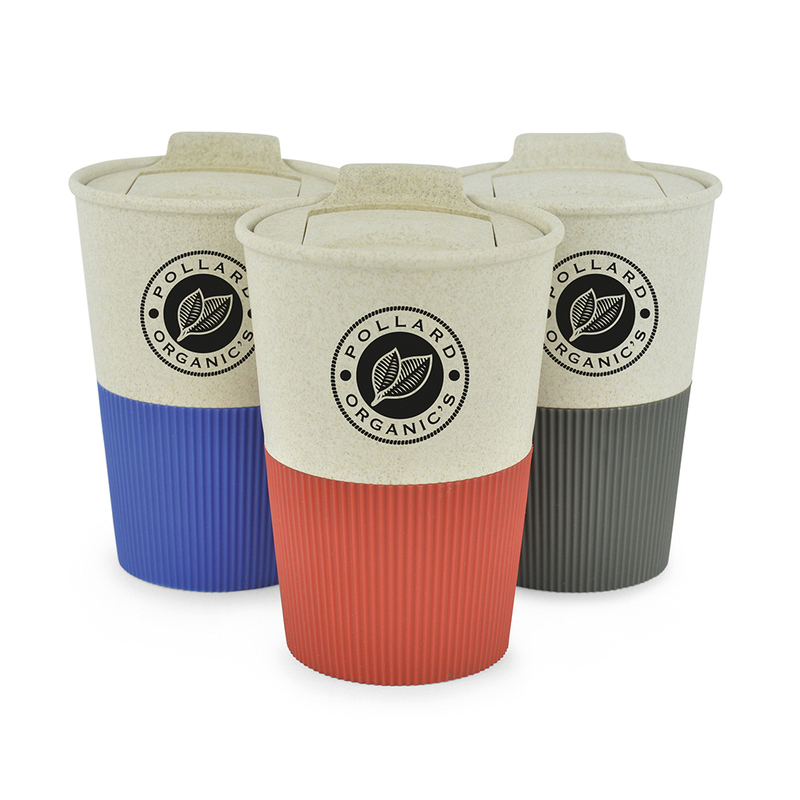 Model:MG0003 DALI COLOUR Description: 450ml coloured stainless steel double walled travel mug with plastic interior and push on lid. Colour Options: Silver Product Data Specification Product Size 170 x 88 mm dia. Product Weight Ink Colours If Applicable N/A Additional Information Price includes a 1 colour wrap print. Price excludes Carriage & Origination. Lead Times 5 working days from artwork approval. For Priority Service Lead times and pricing info please visit Priority-Service for more information. Personalisation Data Max Personalisation Pad/Screen Print Area 170 x 45 mm Engraving Area 65 x 55 mm Full Colour Area N/A Embroided Area N/A Max Spot Colours 4+ Foil Block Embossing N/A Notes Price includes 1 colour wrap around print. Set up and carriage are additional. Model:MG0022 DURER Description: 400ml narrow tea cup shaped double walled travel mug with stainless steel interior and push on lid. Available in three colours. Colour Options: Blue,Red,Trans Product Data Specification Product Size 170 x 89 mm dia. Product Weight Ink Colours If Applicable N/A Additional Information Price includes a 1 colour wrap print. Price excludes Carriage & Origination. Lead Times 5 working days from artwork approval Personalisation Data Max Personalisation Pad/Screen Print Area 170 x 35 mm Engraving Area N/A Full Colour Area N/A Embroided Area N/A Max Spot Colours 4 Foil Block Embossing N/A Notes Price includes 1 colour wrap around print. Set up and carriage are additional. Model:MG0809 FROSTY Description: 500ml double walled plastic tumbler with frosted exterior and coloured anti-spill screw top lid with sipper. Available in 5 colours. Colour Options: Amber,Black,Green,Royal,Blue,Red,Yellow Product Data Specification Product Size 226 x 82 mm dia. Product Weight Ink Colours If Applicable N/A Additional Information Price includes a 1 colour wrap print. Price excludes Carriage & Origination. Lead Times 5 working days from artwork approval. For Priority Service Lead times and pricing info please visit Priority-Service for more information. Personalisation Data Max Personalisation Pad/Screen Print Area 170 x 100 mm Engraving Area N/A Full Colour Area N/A Embroided Area N/A Max Spot Colours 4 Foil Block Embossing N/A Notes Prices includes 1 colour wrap around print. Set up and carriage are additional. 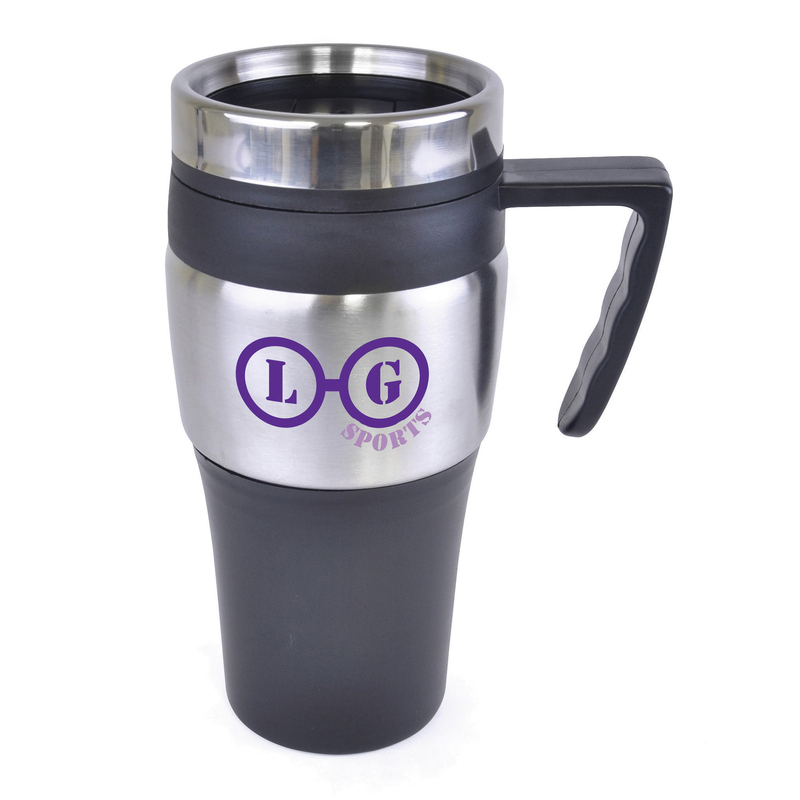 Model:MG0021 GOYA Description: 375ml stainless steel double walled travel mug with screw on lid and slide cover. Colour Options: Silver Black Product Data Specification Product Size 180 x 85 mm dia. Product Weight Ink Colours If Applicable N/A Additional Information Price includes a 1 colour wrap print. Price excludes Carriage & Origination. Lead Times 5 working days from artwork approval. For Priority Service Lead times and pricing info please visit Priority-Service for more information. Personalisation Data Max Personalisation Pad/Screen Print Area 165 x 35 mm Engraving Area 65 x 45 mm Full Colour Area N/A Embroided Area N/A Max Spot Colours 4 Foil Block Embossing N/A Notes Price includes 1 colour wrap around print. Set up and carriage are additional. 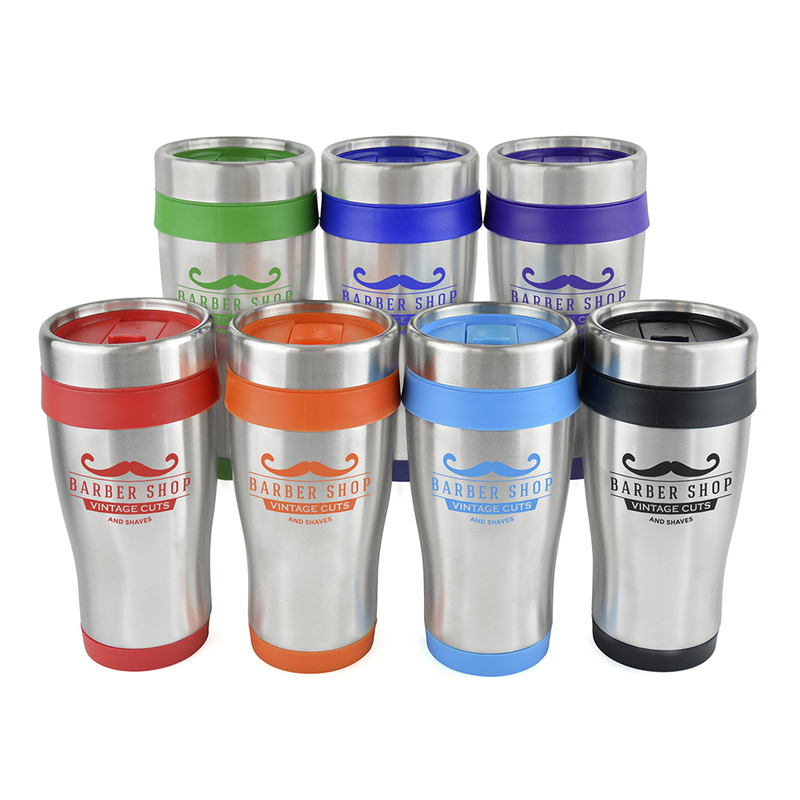 Model:MG0806 GRIPPY Description: 330ml single walled plastic tumbler with matching plastic slider lid and coloured rubber grip. Grip available in various colours. Available in 10 colours. Colour Options: Amber,Black,Blue,Cyan,Green,Grey,Pink,Purple,Red,White,Yellow Product Data Specification Product Size 130 x 92 mm dia Product Weight Ink Colours If Applicable N/A Additional Information Price includes a 1 colour wrap print. Price excludes Carriage & Origination. Lead Times 5 working days from artwork approval Personalisation Data Max Personalisation Pad/Screen Print Area 170 x 35 mm Engraving Area N/A Full Colour Area N/A Embroided Area N/A Max Spot Colours 2 Foil Block Embossing N/A Notes Price includes 1 colour wrap around print. Set up and carriage are additional.